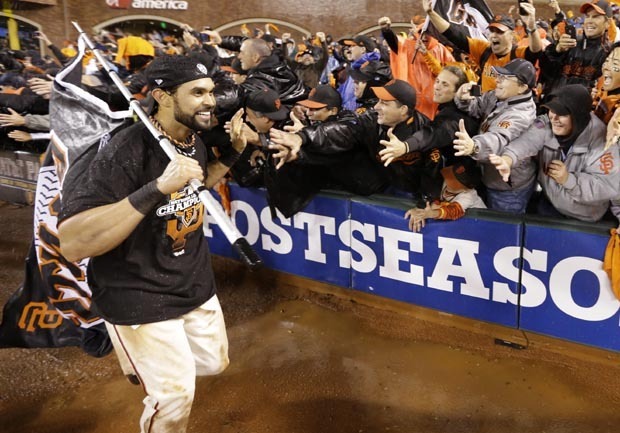 SAN FRANCISCO San Francisco Giants fans walked in a daze Tuesday morning near the team's soggy waterfront ballpark, still not quite believing that just hours earlier their rain-soaked squad had clinched the National League pennant. As dozens flocked to the team's merchandise store, snatching up sundry items and celebrating the Giants' unlikely comeback victory over the St. Louis Cardinals, the reality began to set in. Jack McKenna, a lifelong Giants fan, and his newlywed wife, a Tigers fan, were in town from Florida on their honeymoon, and planned to buy tickets. When they planned to spend their honeymoon in San Francisco, neither thought it include a World Series game. "The timing was just great," Jack McKenna said, clutching his newly purchased gear. His wife, Sharon, still wasn't sure if she'd loudly root for Detroit if the couple managed to score seats to one of the first two games. "That's not a good way to start a marriage," she said with a chuckle. The cheapest tickets on Stubhub.com to Wednesday's first game of the World Series against the Detroit Tigers were already $382 for the nosebleeds; thousands of dollars were being asked for premium field-level perches. Ticket sales were brisk for the Fall Classic, yet reaction on the street was still one of Giants' fans coming to grips with the dramatic come-from-behind win. "Being underdogs in the last two series against Cincinnati and then coming back against them ... and then having our backs against the wall (against St. Louis) and coming back and winning it. Nobody figured it, it was great," said Don Brenes, 61, of San Francisco. Some fans admitted they were not making plans for the World Series, and had doubted their team would pull off wins in a record-tying six elimination games against the Reds and Cardinals needed to make it. That has led to a scramble throughout the Bay Area to reschedule plans for Wednesday night. Bars are preparing for crowds and parties are being planned for at least four more games in the Giants season. "Numerous times I thought it was over. It looked so bleak," said Kay Cockerill, standing in line at the ballpark store with shirts and socks. "But the momentum can change, and it just flips around and the confidence just multiplies."